I know. I promised. I wouldn't waste anyone's time with an annoying budget post. I'm like a compulsive gambler. Minus the chips, add a keyboard and some half-witted attempts at humor. A bug drawn to light. Whatever. 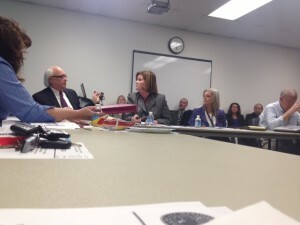 I went to the joint Council – Schoolboard budget work session last night. Given our new-fangled budget process I really didn't know how long the meeting would be but an hour or so seemed about right. As it turns out, there were many items to be discussed that were NOT on the agenda last night. Agendas are not normally a problem for us….anyway, the schools showed up and we talked about thier budget. I gotta tell you – what a difference. Gone are the days where nobody really seemed to know the answer and the City people rolled their eyes at the school people. DMag is really good at what she does. If the School Board lets that woman leave anytime soon they're idiots. She was confident and, based on her experience last year, pretty much anticipated the questions she got. Her staff were prepared and confident. The age old "why are our per capita costs higher" question has been put to bed (class size and a few odds and ends – PWC is struggling to catch up to us on that account). There's an actual CIP that's more than a trial ballon. I didn't sit through the blood, guts and feathers (thanks Jon) school budget sessions but the school board seems united behind their agenda. They set goals and instructed their executive to prosecute that agenda. She gave them what they wanted and they've backed her. That's the way the governance process is supposed to work. The City Manager is not so lucky. We gave our executive fiscal guidance, he presented a budget that accomodated that guidance. He then took the further step of helping make our budget more transparent by placing the Jail costs into the operating budget and not year end. Paying for operating costs out of what we call "one time money" is a bad idea. This had the side effect of adding $1.5 million to the city's operating budget. That's a big number for our General Fund budget. The Manager realized this and absorbed about half the cost in his operating budget to make the number easier to take. He also – unilaterally – setup a Jail fund that we don't share with the schools. This in an attempt to keep the cost as low as possible. Technically the schools are entitled to half of that money for the jail but they haven't complained so far. I support the Manager in his efforts. Given his almost non-existant tenure and lack of major staff members when he started, he put together a hell of a budget. Is it outside the Council's fiscal guidance? Yes but the moves he made are wise. Is it a tax increase? Yes. However, in 2004 dollars, per-capita tax revenue is only $100 higher than it was in 2004. 10 years. $100. Seems pretty tight to me. Manassas average tax bill will be $350 lower than PWC. Almost $2,000 lower than Fairfax. We're paying jail expenses, not (gasp) starting a Parks and Rec department. In any event, the Council voted last night to not advance the Managers budget. I can't explain it. In this neck of the woods if you're the cheapest place to live….you're just the cheapest place to live. It's great to have low taxes – believe me I pay almost every tax we have and would prefer that they were lower. However, if you're the cheapest place to live you have to accept the natural consequences of such an agenda. As you cut the budget you *will* have to reduce services. In our budget that means eliminating positions. You're going to have increasing crime, less solid development, fewer businesses locating in the city and an increasing real estate tax burden as the businesses and well-to-do residents continue to leave. It's a downward spiral. It *will* feed itself. You have to compete in the context you're given. In my business, if I elect to eliminate a service or not provide a service that my competition provides, I have to accept the consequences. The City is no different. Anyway, I think the schools are starting to get it done and I support the City Manager's budget. Both of our executives know their business and we should support them. I do. Well said. I would add that our general fund expenses (basic government services excluding the utilities) are LOWER than they were 10 years ago. That is in real, not adjusted for inflation dollars. Just think of the increases in things like gasoline and medical benefits that the City pays like any other business. At some point we have the type of community that we are willing to support. I want to thank this schools superintendent also for holding her "Saturday with the Superintendent" sessions and the open house at the new school HQs – plenty of opportunities for parents and members of the community who don't have children in the public schools to hear about the school budget and progress and orchestration in building the new Baldwin schools. Thanks for this post and photo Andy. Prince William Today had an editorial about how "stung" they are by the mayor's remarks about the gap in news coverage….I'll be interested in seeing if they have an online article covering this, since they insisted "he of all people should know there are indeed local papers publishing online every day." He was just acknowledging what I hear all the time — heard it again on Wednesday at the Trinity Church Lenten Lunch. There is a gap. Thank you for bridging it, Andy. You know I don't agree with the fixed percentage formula Andy. But it is what it is. I'm more interested in the Council vote though, since the meeting isn't available for us to see after the fact (why is this? My opinion far too much happens in the non-Monday meetings that aren't televised and we see no minutes for over a month, that's NOT transparent government!) and you know my stake. Were there key points of opposition? What was the vote? What happens next? David is right. So what happens next? Is there going to be some sort of closed door meeting? You guys need to get it together. Any person, whomever they should be, thinks it was not I guess skipped over Pages 1 though 7 in the Budget Book. Was the City Council's Priorities and Implementation Plan approved? Were there any dissenters? No, Vote Unanimous (City of Manass Council dated February 25, 2013; Item 10). Is this Council's Plan tied to the Comprehensive Plan aka Manassas Next 2032? Yes…or did these same whomever never bother to read that document also? What was the vote on the Comp Plan? Were there any dissenters? No, vote unanimous (Council Minutes dated July 8, 2013; Item 10). So, the City Manager, who builds a budget based on the ONE HUNDRED PERCENT APPROVED Council Guidance Documents, keeps Department Budgets as flat as possible, and even finds a corrective solution to the vexing issue of the Jail funding that several County Supervisors are on record thinking we in the City do not pay our portion (as noted in the recordings and in the BOCS Directives in published Minutes)……gets dumped on because several Council who issued the mandates to begin with are now waffling? Well, looks like while yellling "CHARGE" some fearless leaders have advanced to the rear. The only leader who ever succeeded in advancing to the rear was Captain Parmington in F-Troop…and that was all make believe. Andy, my friend, you're awfully quiet on not answering Tom and David…and now me…on what was the vote, and by whom? Since it was a Public Meeting, you can report that here. Vote was 3-3. Way, Aveni, Lovejoy against the proposed Managers budget. I don't want to lay out their positions but they seemed to think the budget too rich. I'm not going to spend a bunch of time laying out what I think. You guys know where I am on this stuff. Many thanks! And I am truly puzzled how it was "too rich" as, like I said to you at the coffee, I have not been around to work sessions since I agreed with Pete and his Staff's proposal. And personally still waiting for PWC to drop their Shared Services billing. Tom: There are no "closed door" meetings in city governance with respect to the budget. The only time the Council meets in closed session is to consult with lawyers or discuss personnel matters. What's next? Dont' know yet. who is running for City Council? Anyone? Andy gets it! It isn't good to be the cheapest place around. There seems to be too much talk of going on the cheap around Prince William County also, led by the same political mentality. Thanks for the encapsulated version of what happened. I hope it doesn't happen in the county. We shouldn't be competing for the cheapskate award. Neither the City or the County want to attract just people who want to live on the cheap. Andy, you do a wonderful job at promoting the City. That is so important when you look around at the people (yes, some of them politicians) who do nothing but point out flaws, both real and imaginary. Presentation of the proposed City Council's FY2015 Budget is this coming Monday night, April 14th, at around 6:40 p.m.